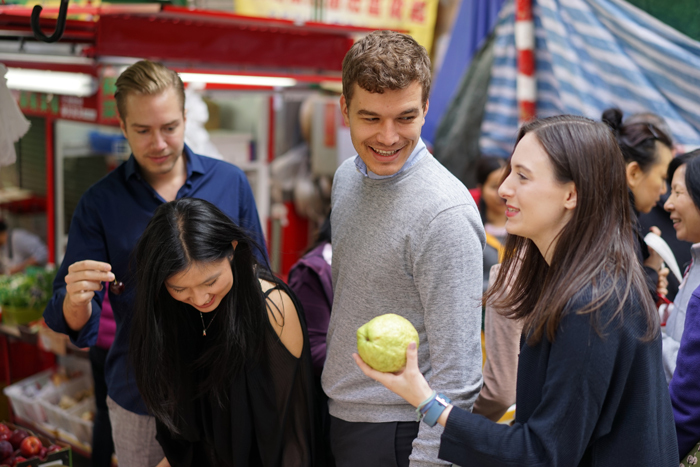 Students from Melbourne Business School were recently in Hong Kong as in-company consultants to firms such as Deloitte and PwC, to get a taste of living and working in one of Asia’s financial hubs. 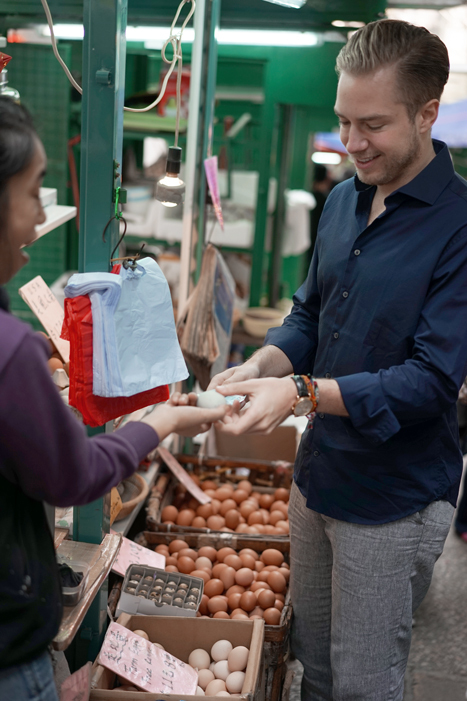 Could you imagine living and working in Hong Kong before completing your graduate degree and getting a taste of what it’s really like in one of Asia’s financial hubs? Melbourne Business School (MBS) students can do just that with the Global Business Practicum (GBP). Through this intensive subject, students work overseas at a designated host company as consultants on real business cases. They gain real working experience, while taking in the destination city’s sights and sounds, sampling local cuisine, and learning about both the region’s business and everyday cultures. reminded me of dinosaur eggs in Jurassic Park! It was, in fact, a ‘Century Egg’ and I just had to buy one. Peeling off the shell revealed a greenish jelly - very cool! I honestly expected worse taste-wise, but I actually quite enjoyed it!" In January 2017, 44 MBS students went on just such an international experience. For two weeks, they were taken out of their classrooms and into the Hong Kong boardrooms of some of the world’s leaders in business, which included big players such as KPMG and PwC, as well as the boutique offices of companies the likes of Asian Private Banker and the Hong Kong Institute of Certified Public Accountants. These student teams worked side-by-side with the locals for two weeks of problem-solving and consulting, before culminating their journey with a final presentation of their solution to the host company. Following a round of applications and interviews, successful students are provided with two days of training, during which they find out their groups, assigned host companies and the project brief. This allows them to put in approximately a month of research prior to their arrival at the companies. Briefs have varied from producing marketing plans to developing financial models. After arriving at their destinations and meeting with their hosts, the groups discuss their project with their academic supervisor to present what they will deliver before it is signed off by the host company. Be part of the company for two weeks. Mentorship and guidance are provided by both the host company as well as the academic supervisor to keep the learning and project delivery on-track . The overseas experience ends with a final presentation to the host company and academic supervisor. Students produce a self-reflection piece, participate in peer reviews, and submit a final report after returning to Melbourne. A Business Practicum Showcase is hosted by MBS, allowing industry partners, Faculty staff, and fellow students, to speak directly with the groups to find out more about their work and future plans. "Working with KPMG Hong Kong has definitely been a milestone in my career path and has helped me in various aspects. Working on a two-week consulting project, while challenging at times, was actually very rewarding because our team was such a multicultural one, and we were able to leverage on our individual strengths and languages, and I got to experience first-hand how beneficial this is. We had great help from our host mentors as well as from other KPMG colleagues. This gave us valuable insight into the Chinese (infrastructure) market, as well as what it was like to live in China and Hong Kong – all imperative to our consulting project. In a nutshell, it was an incredible and valuable experience, and I feel it bridged study life to work life seamlessly." "Our final presentation to our company directors at the end was one of my most rewarding experiences of the GBP. Within ten days, we had pieced together a series of practical and actionable recommendations and we were delighted that it was well-received by our hosts. 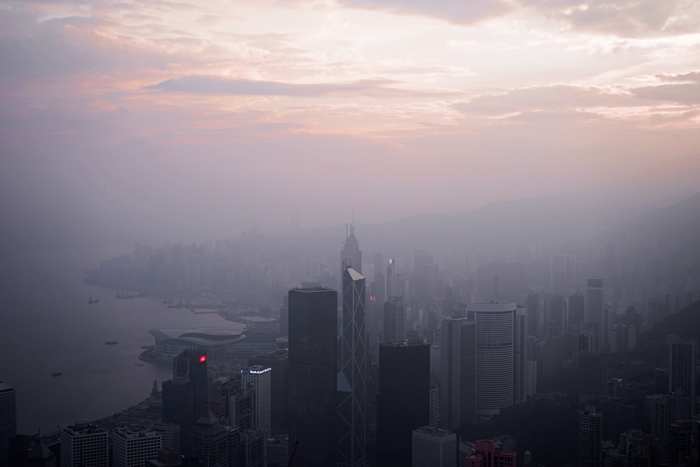 Being there for two weeks showed me what living in Hong Kong is like. It’s definitely different to Melbourne! It’s a fast-paced, diverse city with lots to see and do. Asides from shopping and sightseeing, the city offers some hiking trails which boast spectacular views. One really memorable experience was a group hike to Victoria Peak one night after dinner. Although the path was steep, the view from the top was incredible! The GBP has certainly strengthened my desire to return to Hong Kong to work!" "This was not just my first visit to Hong Kong, but also my first time ever in Asia! Something I realised about being in this busy city is: Be prepared to run, or be run over if you don’t walk fast enough! Travelling by MTR (Hong Kong’s Mass Transit Railway) during peak hour is a great experience. It is something that I’ve never experienced before. Coming from a small village in Italy, with only a few hundred people calling home, this can be overwhelming, but you get used to it quickly. Work in Hong Kong is fast-paced and high standards are demanded at all times. Long hours and weekends of work happen more often than not, and it was certainly a different experience for me. The GBP is a unique experience that sets it apart from traditional classroom learning. It will test your ability to be able to compromise and work as a team, organise and plan ahead, and to work independently with minimal instruction from the academics." "The GBP is an intense experience. There were so many moments in which I was challenged with situations or concepts that were completely new to me, however compared to a traditional lecture, consulting in-company meant I had to jump in and learn, with no opportunity for research, or, sometimes, even for discussion. I had to be open-minded, engaged, and analytical, and I believe I have benefited greatly from this. We were also able to get to know our academic advisors and really learn from them in a way that is simply not possible in a large lecture theatre. They were able to help us identify our strengths and weaknesses and to guide us to produce better-quality projects." GBP students(L-R): Daniel Geuther, Monique Lau, Paolo Cabrini and Nadia Okraglik at Graham Street Markets - a wet market in the middle of Central Hong Kong.